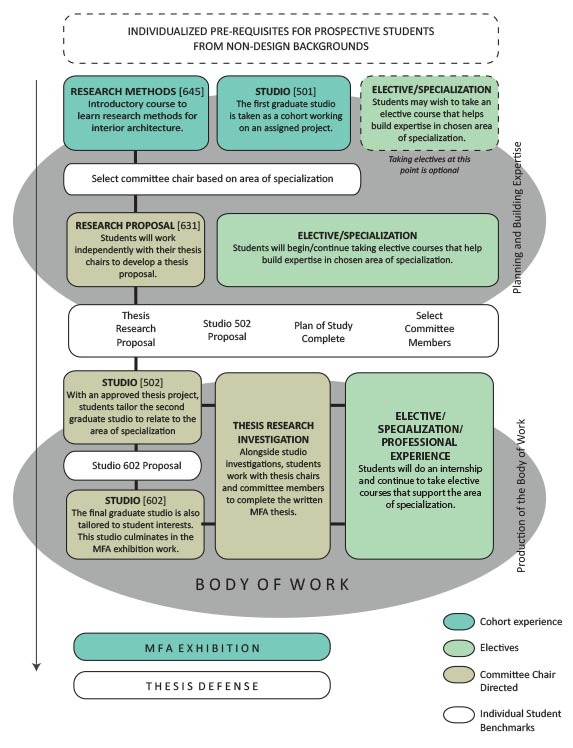 With prior approval by the Director of Graduate Study or the student’s thesis chair, a student will select a minimum of 27 hours in this area from the IAR courses or from other 500 and 600 level courses taught in related areas in other departments. With prior approval by the student’s thesis chair and the Director of Graduate Study in IAR, a student will select a minimum of 3 hours in this area. Both courses can be taken twice for credit. The following diagram illustrates the 60-hour curriculum with benchmarks that students achieve in route to completing the degree. To continue forward in the program, students must have successfully completed two semesters of full-time graduate work, possess a B (3.0) average in all courses taken during the first two semesters, and have an overall grade record consistent with the regulations stated in The Graduate School Bulletin.